Over the years, gym-goers have evolved into numerous sub-species, each with its own look, rituals and attitude. Some have been around for a while, while others are more recent arrivals on the exercise scene. They roam their natural habitat, often in an uneasy co-existence with rival groups. People who don’t use the gym may find this guide fascinating. Those who do will certainly be able to tick off a few of types listed in their gymspotter’s guide. Read this piece with the unmistakable tones of David Attenborough’s voice in your head as if you were watching a TV wildlife documentary. Regular gym-goers will easily recognise him (I haven’t seen any females exhibiting these types of extraordinary behaviour). When he goes from an exercise where he trains, let’s say, his arms, to one for the calves he always picks the exercise which is on the other side of the gym. In this way he can have a little stroll and a quick look in the mirror, which brings us straight on to our second type. A big part of going to the gym is looking in the mirror to see how well your veins burst out on your biceps. It’s unfortunate for some guys that not all the machines or places to work out have mirrors around them. 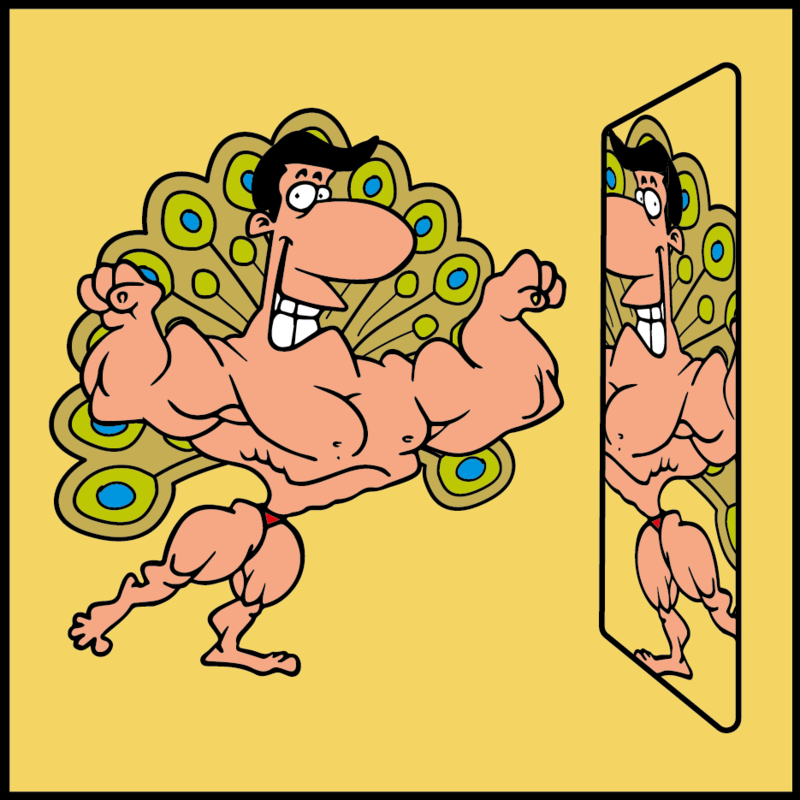 In the same way that a peacock displays its magnificent feathers, Mirror Guy poses proud and ostentatious, admiring his reflection. The fact that not every corner in the gym has a mirror is unacceptable to him. You should always be able to look at yourself in the mirror, that’s what the gym is all about after all. If you’re lucky, you might even spot a combination of Walk Around and Mirror Guys, though they’re rare. An all-time favourite that was born when the first iPod came onto the market. In most gyms music is playing quite loud already. Still, some are able to make themselves heard all the way on the other side. Either they have their music playing so loudly through their earphones that they can’t hear themselves, or they just do it deliberately. Some people move around anonymously and some want to be noticed. Making noise can be a sign of over-compensating. Perhaps they fear that others might surpass their lifting prowess. A creature that feels threatened will do everything to protect its own territory. I’m never sure whether pushing that last bit of their set makes them produce those grunts, yells and very deepest of exhalations, or they just do it to focus all the attention on them. At times, the gym is as noisy as any zoo. This one is another phenomenon that passes by quite frequently. Some gyms use free weights that you can drop on the floor without doing any damage. Because it’s possible, some people think they simply have to do it. Carefully observing this type from above, if possible, is the best method. You don’t want him to notice you as he might get afraid and run of or want protects his territory and starts throwing weights at you. Maybe it’s just my opinion that you can just lay down your weights on the floor or back on the racks after you’re done, or make sure the grip on your gym gloves is a bit better. Gym glove. Ha ha. CrossFit tries to bring a more competitive element to fitness by having you complete a certain amount of repetitions across several exercises in as little time as possible. It means that some people are able to use up to eight different pieces of equipment in a short space of time. Regardless of whether the gym is empty or not, this type will always try to occupy every piece of equipment in there. Even if you’re using it, he’ll try. Apparently, the incentive for this is to save time. Be careful when spotting this type not to burst out in laughing in his face – you don’t want to scare the little fellow. I’ve made the beginning of a list that has the potential to become a very long one. No-one knows what the future holds, so keep your eyes open. As each new type is revealed by its behaviour and not its looks, it might take some time before you can be really sure that you have a new one on your hands. When you have noticed something, thought REALLY?! and begun giggling, congratulations – you’re the proud discoverer of a new of gym sub-species. If you do manage to spot a one don’t hesitate to get on the phone to the Natural History Museum.